Christmas Markets in Yorkshire. One of the best parts of the festive season? We certainly think so! Whether you’re struggling to get into the Christmas spirit or have already put up that eight-foot Santa on your front lawn, this great selection of Christmas markets is sure to get you excited about the festivities. 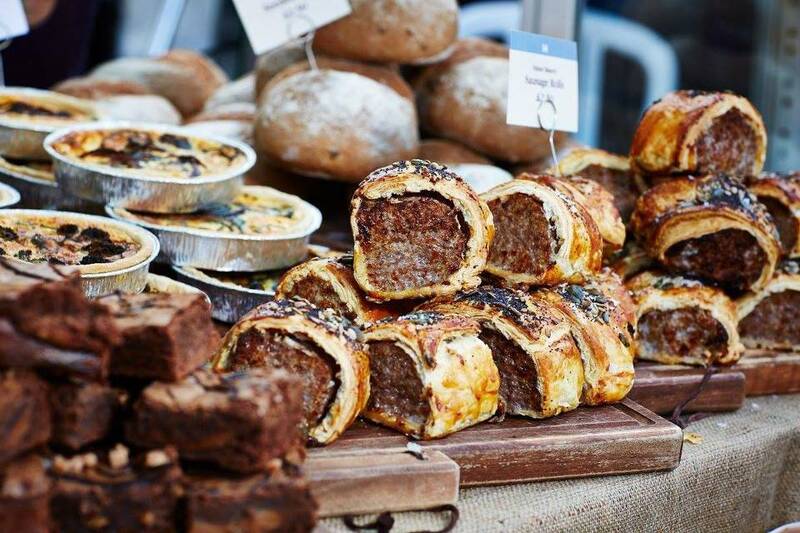 Fill up to your heart’s content on mulled wine and mince pies, shop from a wonderful selection of stalls and admire the softly twinkling lights, then treat yourself to the season’s finest array of street food and independent produce. Get out there and enjoy these Christmas markets in Yorkshire. The Beverley Festival of Christmas is back for its 23rd year. A traditional but lively festive event, with three Victorian Markets and performers in Victorian costume. It’s the perfect place to relax and enjoy a mince pie while browsing the crafts and bumping into Santa, Rudolph and friends. Don’t forget to take advantage of the selection of street food before you hop on the Victorian fairground rides! 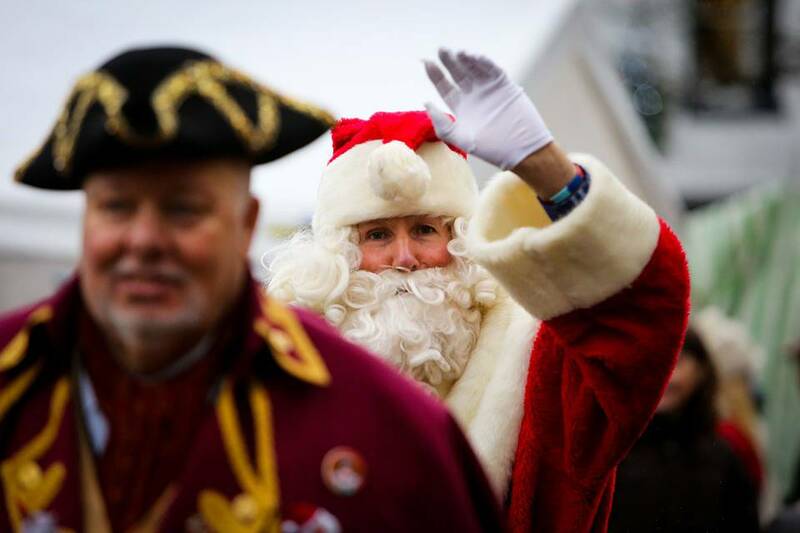 7 a.m – 11 p.m.
For a spectacular and memorable Christmas event check out the Piece Hall in Halifax. If you’re looking for live music, family shows, late-night cabaret, comedy, or the absurd DIY Chef and much more, then look no further! Enjoy all this entertainment in the beautiful courtyard of the hall, and get all your Christmas shopping while filling up on the region’s finest food and drink as well. This is sure to get you into the festive spirit. (Ticket prices vary). 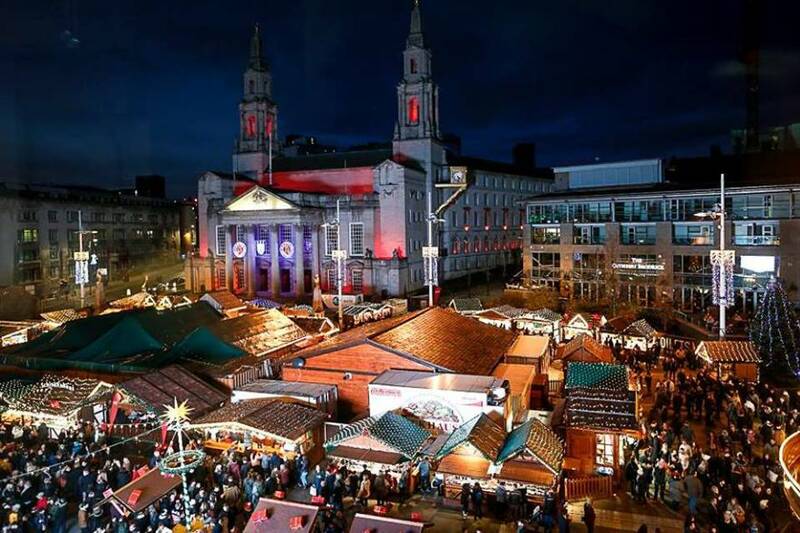 The Leeds Christkindelmarket was started in the winter of 2002 in partnership with the Frankfurt City Council in Germany, so it’s definitely one to visit for a traditional and authentic Christmas Market experience. The Alp Chalet restaurant, Ski Hutte Bar and Kuh Stall offer tantalising smells and are sure to warm you up after browsing the many stalls laden with handmade decorations, candles, crafts and gifts. If you’re a little hardier to the outside, the many food stalls offering sweet and savoury snacks and meals are the place to be – time it right and you can treat yourself to some food accompanied by live music. Santa will even be visiting for breakfast on Saturdays and Sundays from 24th November – 22nd December. Thor’s Tipi Bar embraces the Viking history of Yorkshire to bring a wonderfully wintry establishment. Featuring fire pits, hot cocoa or alcoholic beverages, and cosy furs for adults and families alike to enjoy, everybody will find a space to relax in Thor’s Tipi. A Leeds favourite – The Mussel Pot street vendors will be returning with a wonderful new menu including raclette, burgers and their famous mussels. 11 a.m – 5 p.m. Interested in what Christmas was like for your great-grandparents? The Grassington Dickensian Festival is the perfect place to find out. Step back in time and experience traditional live music and varied performances, Dickens’ characters, shoe shines, roasted chestnuts and Punch and Judy. This is one of the Christmas markets in Yorkshire with a difference, but don’t worry, there is still a large range of indoor and outdoor market stalls for present shopping, and local food for a magical Victorian Christmas. The Malton Christmas Market is the place to be if you haven’t quite yet mastered your Christmas menu. With live chef demos, yummy figgy puddings, turkey and goose, gin, mulled wine and so much more, head over to Malton for a wonderful day out. If you’ve not had a chance to get those all-important stocking fillers this is one of the best Christmas Markets to do so. Browse their fantastic selection of stalls, then relax and enjoy the season in this picturesque village. Scarborough Sparkle a special Christmas event for all the family to enjoy with over 40 stalls selling quality Christmas gifts, artisan products and festive food and drink favourites. All joined by an ice rink, illuminated rides, moonlight illuminated parade and yuletide choirs. 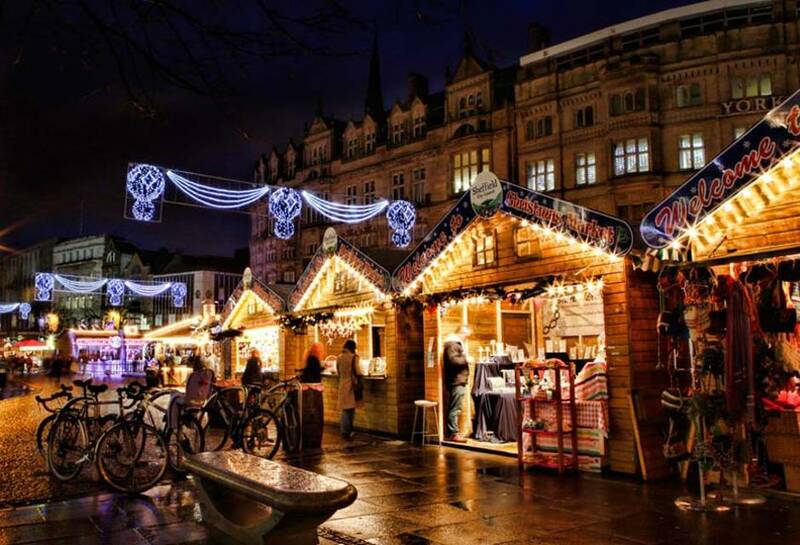 The Sheffield Christmas Market is one of the largest Christmas Markets in Yorkshire which has grown over the past few years to now feature 50 inviting cabins selling every kind of Christmas delight you could want. The Sleigh Bar will be back for 2018 for those wanting a bit of Christmas cheer. Father Christmas will be in the centre of the Peace Gardens, and of course, there will be a range of festive food so make some room for a grilled German sausage! Thor’s Tipi Bar embraces the Viking history of Yorkshire to bring a wonderfully wintry establishment. Featuring fire pits, hot cocoa or alcoholic beverages, and cosy furs for adults and families alike to enjoy, everybody will find a space to relax in Thor’s Tipi. This is a truly Norse themed place, with bespoke timber and Danish ‘hyyge’ all under canvas. A Sheffield favourite, The Gravy Train, will be returning with a classic poutine-inspired menu. Labelled ‘one of Britain’s best Christmas markets’, The Hepworth Christmas Markets are a must for the 2018 festivities. Featuring a range of arty handmade goodies from talented designers, as well as a food and drink tent so you can fill up on all manner of artisan food from the best Yorkshire has to offer. A wonderful day out for the whole family, you can also enjoy the Christmassy performances and free children’s activities. (Note there is a £1 entry fee). One of the most popular Christmas Markets in Yorkshire. Cosy up in the cobbled streets around York City Centre with this large but quaint Christmas Fayre. For all the foodies, St. Sampson’s Square is the place to head, with an array of street food so inviting you’ll want to sample it all. For the family, there’s a Santa’s Grotto in Coppergate. Be sure to follow the twinkly lights around the centre to find all the stalls selling all manner of delights. This is definitely not one to miss for local Yorkshire goodness! Thor’s Tipi Bar embraces the Viking history of York to bring a wonderfully wintry establishment. 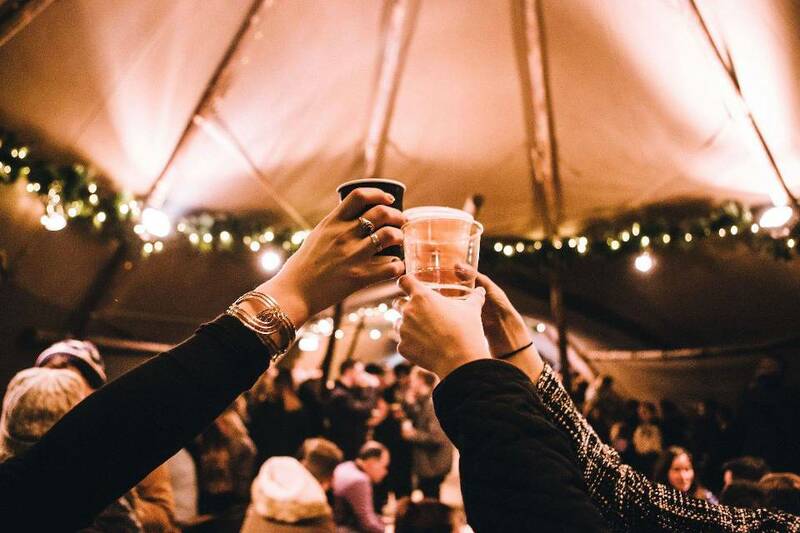 Featuring fire pits, hot cocoa or alcoholic beverages, and cosy furs for adults and families alike to enjoy, everybody will find a space to relax in Thor’s Tipi. Start your feast with York’s renowned Shambles Kitchen, who will be serving a delicious savoury menu. Finish inside the hot chocolate cabin where the Donut Kitchen’s sweet treats will be on offer. This has got to be one of the most stunning Christmas Markets in Yorkshire. 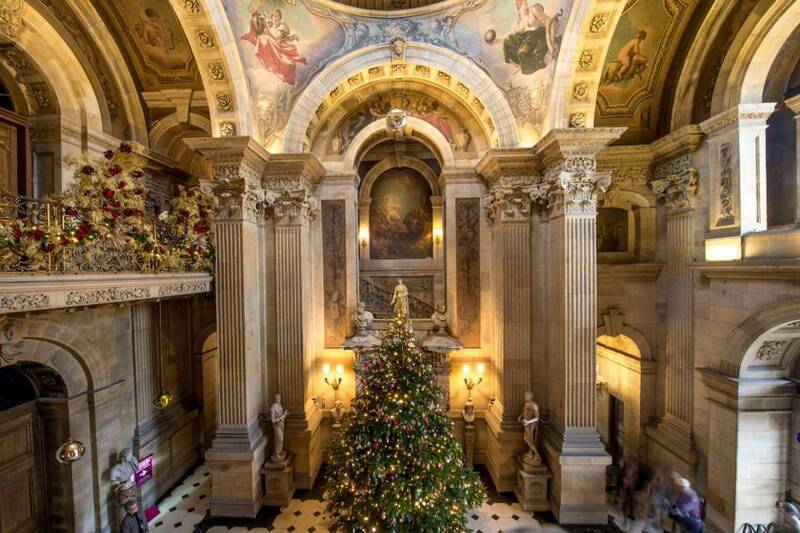 Complete with their iconic 25 foot Christmas tree with over 3000 baubles, magnificent decorations, open fires, candlelight and live music, enjoy a truly magical day out at Castle Howard. Based on the ’12 days of Christmas’, Designers Charlotte Lloyd Webber and Bretta Gereke have produced a stunning array of flamboyant displays and installations to surprise, including a fun indoor Children’s trail. Enjoy an array of indulgent winter warmers from their Christmas Market, pick up gifts from their on-site shops and don’t miss the opportunity to meet the big man himself as Father Christmas will be making some very special visits.